The day had finally come. One I had been looking forward to since August 2012. 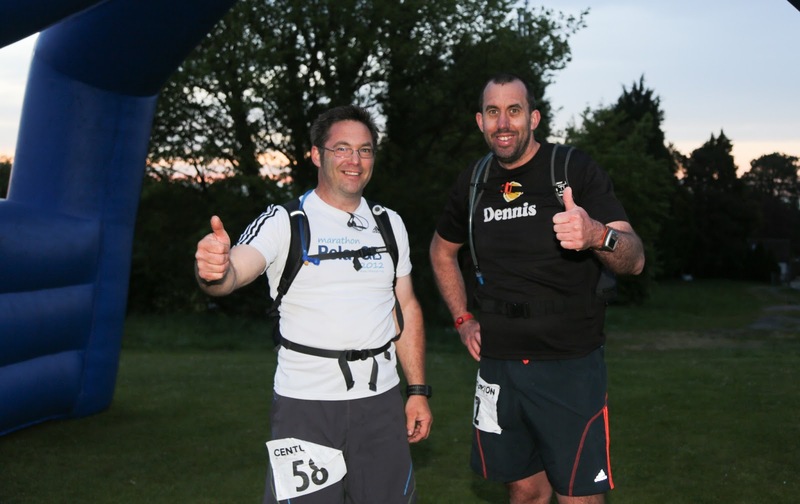 Centurion Running's NDW50 mile ultra. Last August I volunteered to sweep the first 32 miles of the NDW50. A target I knew would be initially difficult, but one I could achieve and one that would challenge me. Last August, I set out to sweep with a fellow runner who was also sweeping, all be it the first 50 miles, Michael Sartorius. Michael and I set out doing our job and naturally got chatting. I think Michael initially thought I was mad. Previously only ever running up to 23 miles on a fell race last June, 32 miles was a big step. Soon realising that the pace wasn't to bad, thanks to having to remove signage as one of our jobs, the conversation soon changed to convincing me to try and do 50 miles with Michael. I must admit, it didn't really take much convincing!! To cut a long story short, as this blog is about this years event, I pushed on beyond the 32 mile aid station. The point I should have stopped at, I even got through the 39 mile aid station. But in between there and the 44 mile aid station I was done! Only six miles short of the target, but it took me a good 20 minutes just to get up Botley Hill! The plan was to sweep and get more insight into ultra running. A lesson I got a lot out of. Mainly the need to eat!! 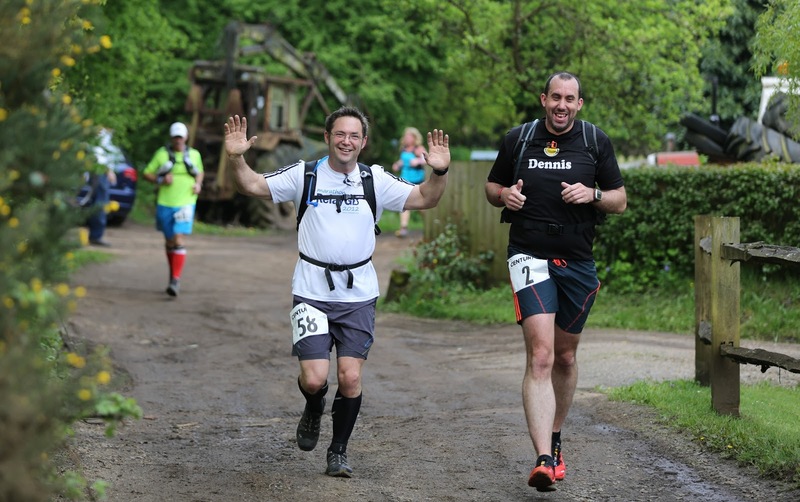 Anyhow, as you can imagine, I was up for the challenge and felt far better prepared after completing the Thames Trot and sweeping 38 miles of the Thames Path 100. Not forgetting 2 marathons in 8 days. The weather leading up to the race weekend had been a bit of a mixed bag. Making it a little difficult when coming to sorting kit. I knew i would be wearing my new Salomon Sense Ultras i had got a few weeks back and had managed a few runs in. They felt great and must thank Tim Lambert for suggesting them! I love a light weight minimal trainer. I had been running in the Cross Speed 3s up until then. I had opted for a short sleeve compression top and a technical T-shirt. Standard Adidas running shorts. Socks were my problem. Do I go with the Twin Skins or the Drymax. As the weather wasn't looking the greatest, I opted for the Drymax. In my rucksack I opted for a lightweight rain coat and other bits of kit that was required. I also added some Cheese and Onion Discos and peanut butter and jam sarnies. Plus two litres of ready mixed pink lemonade Nuun electrolyte drink. With all my kit sorted, the wife drove me the short distance to the Registration area in Farnham. My kit was checked and Robbie Britton was impressed by my crisp selection. I met up with Martin Bushell and Michael Sartorius. This was Martins first Ultra and we had discussed running together, but we hadn't set anything in stone. Michael was once again sweeping the course. This time on his own. No doubt spending it moaning about the weather not being perfect and thinking how he was going to get round the up coming Thames Ring 250. James Elson, the race director, gave his speech and final instructions to us, the runners. I think he may have scared the wife a little when discussing the things that could go wrong?! We then made our journey to the start area. To get there we must cross the railway at Farnham Station, in true fashion, the crossing barriers were down, so we had our first climb of the day, over the railway bridge. I hung around the back of the pack with Martin. Start as you mean to go on. Had a little chuckle to myself about the amount of tape used just to mark the route to the start area. Michael was going to have a lot of tape to remove! We were off. The start of the NDW50 Ultra. Martin and I settled nicely down into a comfortable pace and started chatting. The early part of the race takes you along some country lanes as we head towards The Sands and the course becomes more trail and less road. This part of the course is also very familiar as I live local and train on it. I knew one of my Nemesis's was coming up. The hill up Puttenham Common. Its not a big hill, but because its sandy and during rain falls, the sand gets washed away leaving a lot of flint around. I find it really breaks my pacing up. Thankfully, I managed it without a hiccup and enjoyed the trot down into Puttenham. The first aid station is only 6 miles into the course just next to Puttenham golf club. It always seems a bit early, but I feel its always good to use the opportunity to get food on board. The aid stations on Centurion Races are brilliant. There was always something there plus a few little surprises added by the volunteers. I kept it simple with a cup of water, a few jelly babies and cookies and we were off again. 6 more miles to the next aid station and more food. The course carries on past the golf club and heads east towards Guildford. Eventually passing under the A3 and towards Watts Gallery. The course is pretty flat here and it starts to become undulating as you make your way past Loseley House. Just to the North is the Hogs Back, but the course doesn't head up there, sticking to the Pilgrims Way/North Downs Way. The pilgrims stayed low to avoid the highway men. I was pleased, there were enough hills to conquer this day! Maybe the Pilgrims just didn't like going up hills either?? The course continues past Loseley farm and eventually you come out onto some roads in Guildford. We quickly crossed these and made our way down towards the River Wey. A nice little surprise was in store here. Some kind gentleman had made bacon sarnies and was serving them up to any runners who wanted one. I duly took one, id burn the extra calories off. After crossing the river a little further up, I found my bacon sarnie had ketchup! Do I turn round and get some brown sauce?? Deciding against it, i ate the free and rather tasty bacon sarnie as we crossed Shalford Park. Bacon is pretty hard to eat while running. Learnt something new! We crossed the road and headed along a road called Pilgrims Way?! What a coincidence! This also meant we were starting the ascent to St Marthas on the Hill. If you've never been here before, St Marthas is a church built on what is basically a massive sand dune! Before peeking this "dune", the second aid station welcomes you in. This one i had been looking forward to. The wife was there to meet and encourage me. This was the only time i would see her til once home many hours later. Also the aid station was being ran by my friend Paula Patterson. I was looking forward to seeing what spread she had put out. I also finally got to meet Dave Urwin - the bearded runner. I could have happily stayed here and chatted. It would beat having to get up the rest of the dune! But i noticed no mars bars? My finger was firmly pointed at Robbie and questions were asked. With food in our bellies and fresh fluids taken on Martin and myself made the final ascent up the dune.We did walk a little, until i saw the photograph up ahead. Giving Martin a heads up we started running. Giving the impression we had ran the whole way! Seeing the pic further down, I think we got away with it?! As they say, what goes up, must come down. And we did, quickly. At which point all the shaking induced Martin into his first pee stop of the day. I stood watch/guard. Not watching. After the brief pit stop it was back to some uphill action. The short ascent up to Newlands Corner. This is where my training runs started. The next section is enjoyable but uneventful while staying along the higher slopes of the North Downs Way. I struggled a little along here and Martin went a head chatting to another runner. I was feeling sorry for myself, but also knew the long descent down through Denbies vineyard was coming up, which would lead me to the next aid station at the bottom of Box Hill. I picked myself and got a good pace going down to the aid station. Last time I ran through Denbies vineyard there was wine at there aid stations. Bacchus Half and full marathon are good fun and wine at every aid station! Eventually making the Box Hill aid station, I was pleased to see Martin there waiting for me. I planned to arrive here between 5-5.30 hours, so I was will on course when i arrived at 5.05. A good scoff, but no Mars bars Robbie?! Martin and i set about climbing Box Hill, but first the stepping stones to deal with. I really was hoping Martin wouldn't slip up here, mainly because time would be wasted with me laughing. It turned out to be uneventful and we both crossed incident free. Box Hill is simply a killer. How the lead guys get up there so quick, I do not know. I don't think I could run up it, even with a permanently attached oxygen bottle. Who knew the air could get so thin in Surrey? Once up and realising i was still alive, the views south across Dorking and beyond are stunning and worth the climb. Last year there were Olympic rings up here for the cycling event. Sadly they are long gone. With enjoyable views and some newly found energy we plodded on, ticking of the miles while continuing to head east towards Reigate. At one point we passed Jez Bragg. I believe his wife Gemma was also running the event to gain a qualifying tie for the Western States Ultra! Fair play. I believe she achieved her goal.We eventually got to the bottom of Reigate Hill. The 7 odd miles between Box Hill and Reigate Hill are probably, in my eyes, the hardest part of the 50 mile course. Rhythm is broken up so much along this stretch and with two big climbs it really eats into your time. Well it did mine. Reigate Hill is a tease. Unlike Box Hill which is steps, Reigate Hill is more a steep road, teasing you into trying and running it. FAIL. Back to walking and wondering where my sherpa with the oxygen bottle was. Reaching the top i again bumped into a runner who was supporting his friend running the race. I didn't get his name, and i apologise for that. 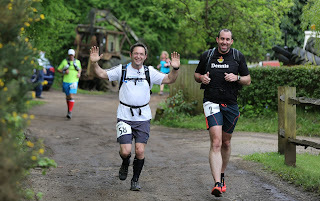 I met hi at the finish of last years NDW50 which he completed. I had seen him a few times during the day, always offering a drink or checking we were good. At the top of Reigate Hill, he gave Martin and I some Jelly Babies. Perfect to help us get through the next mile to the 32 mile aid station. With yet another enjoyable plod along the ridge offering more great views we made the 32 mile aid station. My friend Fi McNelis was waiting here for us, and her other running friends. Fi had rang me while i was climbing Reigate Hill (which i used as an excuse to get a breather in) to find out where i was. Martin and I got some food on and didn't hang around to long here. Mainly because once you get Fi talking, its hard to stop her! Only kidding Fi. Fi is a very jolly ultra runner and will amuse you no end if you ever have the pleasure to meet her. Ask her about the bike pump on the SDW100!! Leaving Reigate Hill behind it isn't long till you get a nice downhill section through a golf course and then along a cricket pitch. Being a nice day, there was a game on. Not sure who was winning, but i would have put money on the team in white! The next part of the course crosses the M25. Up until this point you have been south of it. This bridge crossing indicates that you are now north of it and within its circle. The finishing line is getting closer. Its not long after this you also cross the M23. Back at Reigate Hill, i took a good amount of food on board, as i knew the next aid station was fluid only. The course along this stretch after the motorway crossings is very tranquil with fields to cross and church yards to go through. After what seemed like ages, we came out of the woods and up ahead was an oasis. The 39 mile aid station. But it was different. It had food!! Very good food i hear too. Being a bit of a slower and closer to the back, i missed the ice creams and chocolate coated strawberries. I didn't mind, as i wasn't aware of them at this point. I was pleased to see food and drink. The apple crumble cake was awesome and i joked that i could quit just here and enjoy the evening. But i had a demon to put to rest. It wasn't long after this aid station last year where it went wrong for me. Leaving that aid station behind and having another runner, Alan, join us, we headed off. We had been informed that the Bull wasn't in the field and headed east. It was here that my sock decision came back to haunt me. I was aware i had a blister building under the front of my left foot. I tried to manage it by curling my toes up to ease the pressure. I thought it was working. But then I got a horrible sensation. Initially i thought the blister had popped. But no, it had spread under the skin. 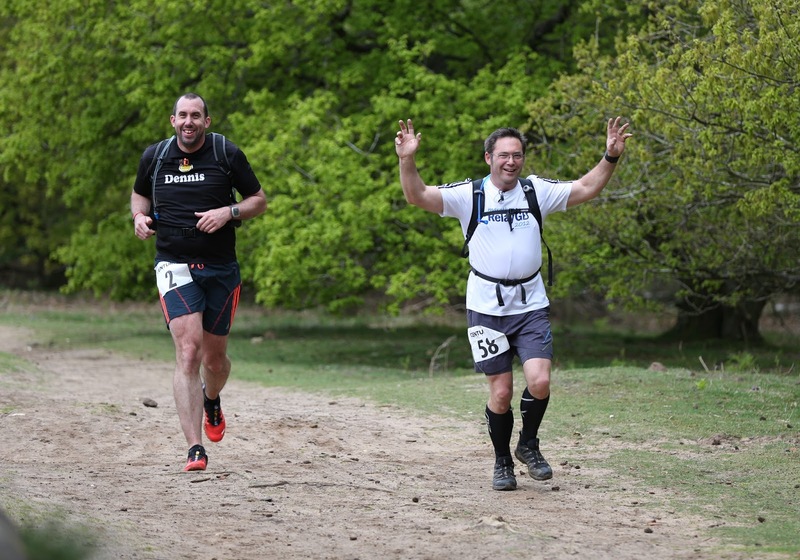 Great, because running the NDW50 wasn't hard enough!! After a while in some woods again we eventually started to head downhill and were running parallel with the M25 just west of the Clacket Lane Services. Last year, as Michael and I made our way around the quarry, I just stopped. I felt very sick but wasn't. The tank was empty. This year I ran around that quarry like a gazelle. A grazing Gazelle rather than one being chased by a Lion. But none the less a Gazelle. We then came to the field with the Bull. A nice sign up "Beware Bull". I think Alan was concerned, as if there had been a Bull he may have had out walk it. Thankfully there wasn't! We made it incident and Bull free to the bottom of Botley Hill and the last big climb of the course. Martin started to tell me about his training run along this stretch. A magical Peacock. Apparently, during his run down the hill, he saw something he believed was a Peacock. So certain it was, he slowed not to scare it and got his camera out. Eventually getting closer, he confirmed it was actually a plastic bag stuck in the twigs! This helped put a smile on my face, and we continued up the hill quoting Monty Python. Some how we made it to the top. Monty Python helped and i would highly recommend it the next time you have trouble while running. This was a fantastic milestone. Last year it ended here for me, but there was no way i was done. We had got here in 10 hours and still had 3.30 to go. Easy. We set off. Unfortunately we let Alan slip behind. I guess he was struggling and needed to continue at his own pace. I hope Monty Python helped him up the hill. Maybe that's why he slipped behind? About a mile down the road the second blister on my left foot spread. This one on the heel. Right foot was fine? This slowed the pace to walking. And awkward walking at that. I tried to push on as hard as I could, but the pain was tough at times. Martin was fantastic at this point. He stayed with me. We were having fun. We came up to a field with cows in, but opted to take the slightly longer flatter route, the road to the side of the field. I was glad we did too. The cows were hanging around the exit gate like some gang wanting to jump us for our iPhones. Michael tells me he did go through the field and there was also calf's in there. Wise choice by Martin and myself. We were soon in the field behind the finish area at Knockholt Pound. We could see the finish inflatable and here the tannoy. That are the last orders call at the pub. We eventually made it to the road into the village, and i said to Martin "I've got to finish this running". We were off, Gazelle like again (grazing). Running up through the village and the last of the days sunlight drifting in the horizon from where we had come, it was a great sense of pride and achievement to cross that finish line. I was so pleased to see James Elson again and felt honoured to receive my medal and finishers Tshirt from him. I have helped at several Centurion Running events, but this was the first I had competed in. It was awesome. 12.59 hours!! I cant thank James, the Centurion Running team, and especially the volunteers enough. The enthusiasm to put on not just a good race, but a great race was fantastic from every single person on course. The number of people wanting to run Centurion Running events speaks for it self. If you only ever run one ultra, run a Centurion Running one! I was also pleased to see Michael arrive at the finish hall while i was cramming sausage into my face. He had finished sweeping and had helped a few back markers also arrive before cutoff. One of them being Alan who had fallen behind after the last aid station. I was pleased he had made it!! My main thanks has to go to Martin. What a star and true gentleman. Martin had bags of energy and probably could have been in the pub long before I finished. We did even joke about getting a drink in before his wife picked us up. It was also his first Ultra. Martin wanted to run 40 miles before he was 40. I think he made it! We had great fun and he was a great support for me. I was so pleased to see him waiting at Box Hill. So thank you MartinBushell. Same again on the TP100? Run for Fun and Maureen Mo Virtue. London Marathon. Two in 8 days is tough! Brighton Marathon, cool going on toasty! !